Along with Greenpeace, Energy Transfer Partners listed BankTrack, Mississippi Stand, Earth First!, the Sierra Club and Bold Iowa as defendants in a suit that was filed in a US District Court in North Dakota Tuesday. "This case involves a network of putative not-for-profits and rogue eco-terrorist groups who employ patterns of criminal activity and campaigns of misinformation to target legitimate companies and industries with fabricated environmental claims and other purported misconduct, inflicting billions of dollars in damage," the lawsuit claims, according to USA Today. The plaintiffs in the case argue that a number of co-conspirators colluded to disrupt pipeline construction, damage Energy Transfer Partners’ business and relationships and induce their own donations, and that their activities facilitated terrorist acts to meet those ends. The lawsuit also alleges violations of the of the Racketeer Influenced and Corrupt Organizations (RICO) Act. 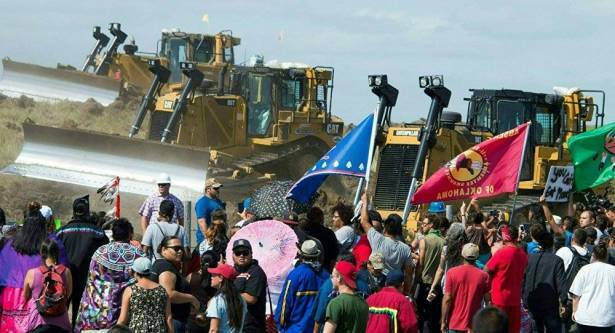 Native Americans and environmentalist have been fighting to halt construction on the $3.8 billion pipeline since last year. They say the project desecrates indigenous lands, threatens water supplies and contributes to global warming by using fossil fuels. Wallace Taylor, a lawyer for the Iowa Chapter of the Sierra Club, said the organization "didn't do anything outside legal avenues," and that the lawsuit is likely being used to intimidate activists and weaken the tide of opposition to the Dakota Access project. Taylor noted that the Sierra Club is still appealing to the Iowa Supreme Court to challenge the state’s approval of the pipeline, maintaining that Dakota Access doesn’t have the proper permits to move forward. Mississippi Stand members Ruby Montoya, 27, and Jessica Reznicek, 36, admitted to taking part in vandalism to sabotage the pipeline, including arson, that allegedly resulted in millions of dollars worth of damage. "The Dakota Access pipeline is an issue that affects this entire nation and the people that are subject to its rule," Reznicek said in a July press conference. "With DAPL, we have seen incredible issues regarding the rule of law, indigenous sovereignty, land seizures, state-sanctioned brutality, as well as corporate protections and pardons for their wrongdoings. To all those that continue to be subjected to the government's injustices, we humbly stand with you, and we ask now that you stand with us." The two women lived in a Des Moines Catholic Worker house that the FBI raided earlier this month, looking for evidence of sabotage, though neither has been charged with a crime. Despite much outcry about the pipeline from Native American groups, no indigenous nations are named as defendants in the 187-page lawsuit.